По состоянию на 1936 год в компании "Junkers" в разной стадии постройки находились три опытных образца четырехмоторного бомбардировщика Ju 89. В 1937 году, вскоре после полета первого прототипа, программа была закрыта, и специалисты компании разработали гражданский ДальшеMore>>> вариант Ju 90. Были построены четыре опытных образца авиалайнера. Следом были построены 10 предсерийных самолетов Ju 90B-1, представлявших собой 38-40-местные лайнеры. Восемь из них поступили в авиакомпанию "Luft-Hansa", а два были проданы компании "South African Airways", но поставлены так и не были. JUNKERS can always be counted on to produce some refreshing variation on a set theme. 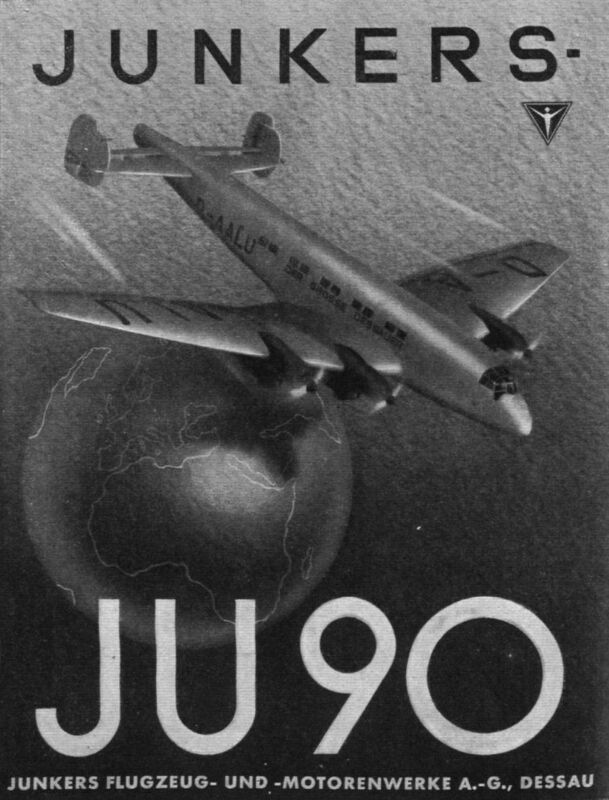 Their latest effort is the Ju.90 transport which has obviously been designed to compete with such types as our Armstrong-Whitworth Ensign, the Douglas D.C.4 and the new American Boeings, none of which machines, incidentally, has yet flown. The application of such ideas as the so-called "double wing," which has given such beneficial results on such types as the Ju. 52 and 85, and the employment of up-to-date inverted-vee liquid-cooled engines has contributed towards a really outstanding aeroplane. It is not to be expected that all operators who may covet the Ju.90 will favour the use of new and little-known liquid-cooled engines, assuming, of course, that these will be released for export, but a variety of air-cooled installations are available as alternatives. At the moment, the Ju.90 is undergoing prototype tests, the initial example being powered with four Mercedes-Benz D.B.600 12-cylinder liquid-cooled inverted vees. 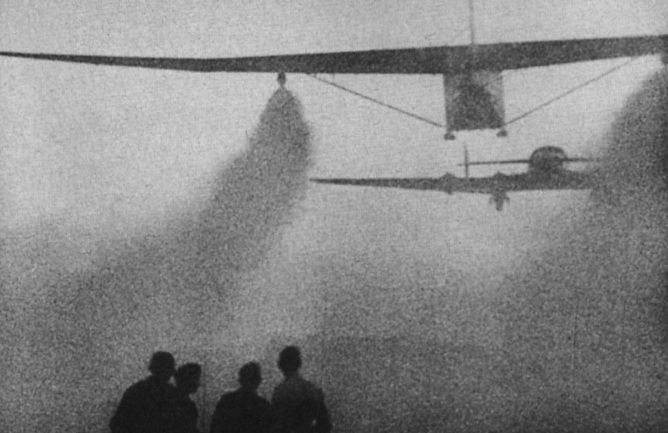 The low monoplane wing is swept back and is built in five sections. There is a centre section built integral with the fuselage, two intermediate portions and the two outer sections. Flaps are incorporated in addition to the double wing feature. Smooth sheet covering is used for the stressed-skin monocoque fuselage. The pilot's cockpit, with dual controls, is located, together with the wireless operator's cabin, in the nose of the fuselage. 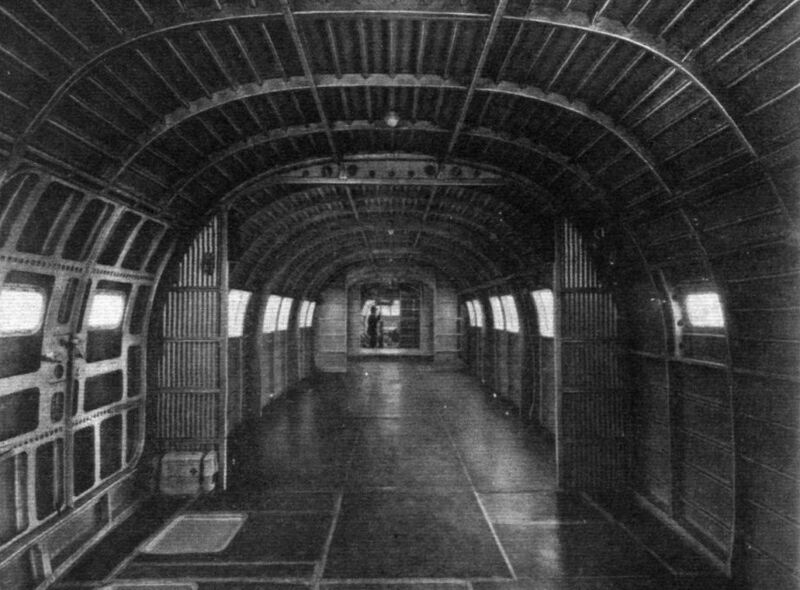 A corridor connects the cockpit with the passenger cabin. To one side of this is a luggage compartment and a cloak-room. The passenger cabin is 34ft. long and 10ft. wide, giving a capacity of 1,836 cu. ft. It is divided into five compartments containing eight seats each and is traversed down its centre by a corridor. 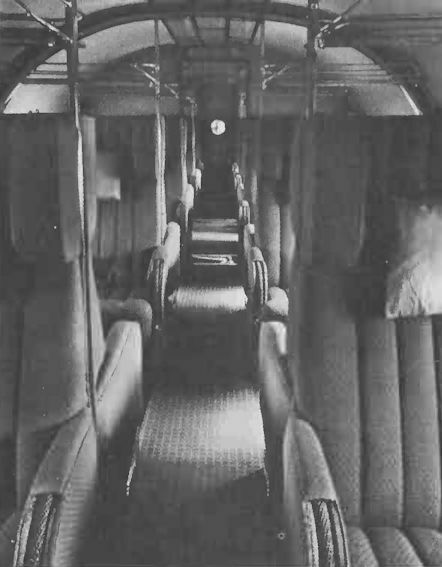 Two W.Cs., a second cloak room, a mail compartment and another baggage room are located behind the main cabin and there is further baggage space in the wing. Twin fins and rudders are used, the rudders, like the tail plane, being of "double wing” formation and incorporating trimming tabs. The undercarriage, including the tail wheel, is completely retractable, the main wheels being nearly 24ft. apart. The inboard engines are fitted to the intermediate sections of the wing and the outboard ones are on the outboard panels. All four mountings arc interchangeable. The fuel tanks are within the wing. Approximate data with four B.M.W. 132 nine-cylinder radials of 800 h.p. each are: Weight empty, 30,600 lb. ; weight loaded. 44,000 lb. ; top speed, 236 m.p.h. ; cruising speed, 205 m.p.h. ; landing speed, 70 m p.h., climb to 1,100 ft./min. 18 sec; ceiling 23,600ft. ; normal range 870 miles. With the inverted-vee Mercedes the maximum speed is said to be 254 m.p.h., the normal range then being 745 miles. Special tankage increases this to 1,240 miles. Ju 90 V1 имел новый фюзеляж, совмещенный с крылом, силовой установкой (двигатели Daimler Benz DB 600) и хвостовым оперением третьего прототипа не пошедшего в серию бомбардировщика Ju 89. Позже самолеты оснащались двигателями BMW 732 или BMW801. 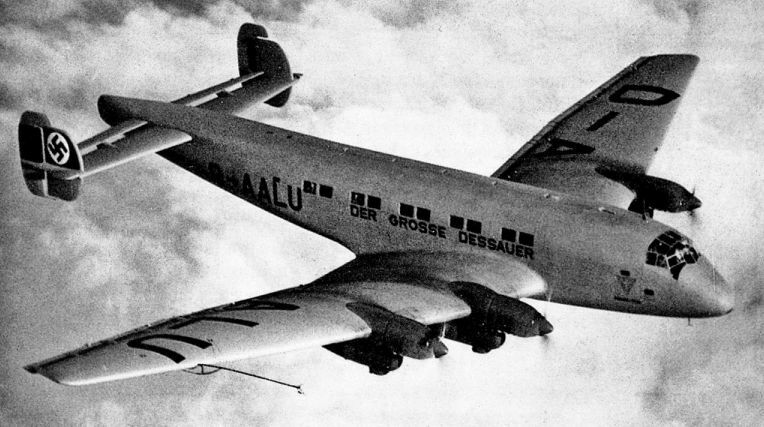 The prototype Junkers Ju 90V1 was D-AALU Der Grosse Dessaur, powered by four Daimler-Benz DB600 engines. It first flew on June 7, 1937, but broke up in flight on February 6, 1938, during flutter tests. The Junkers Ju.90 Four-engined Commercial Monoplane (four Junkers "Jumo 205" hevay-oil engines). Ju 90 имел рампу Trapoklappe с гидроприводом - полностью выпущенная, она поднимала хвостовую часть самолета, что позволяло подогнать под него машину для загрузки с кузова (по ней же машины могли заезжать в кабину). Рампа могла также выпускаться в полете для осуществления десантирования - как на этом Ju 90 V7. 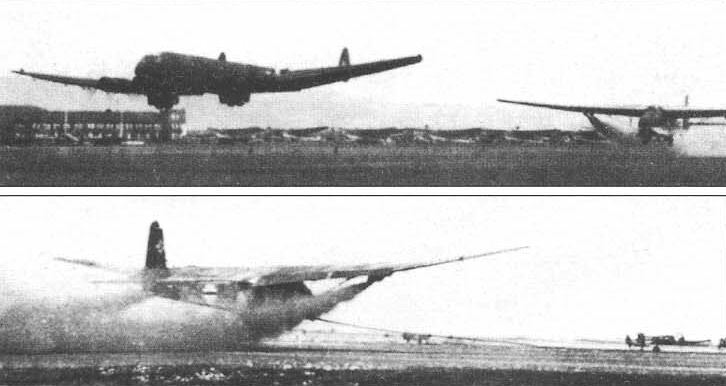 A Me 321, towed by a Ju 90, fades away behind its own murk at Leipheim. The 321 has yet to jettison its front wheels, but the main wheels have already gone. 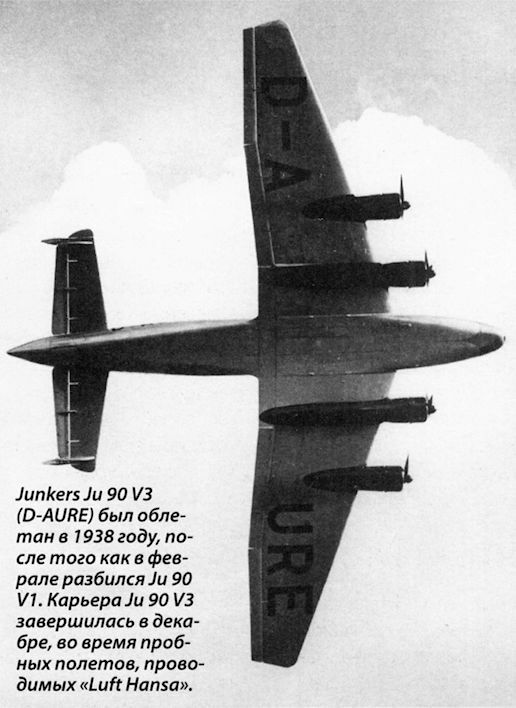 Junkers Ju 90 V3 (D-AURE) был облетан в 1938 году, после того как в феврале разбился Ju 90 V1. Карьера Ju 90 V3 завершилась в декабре, во время пробных полетов, проводимых "Luft Hansa". Один из первых Ju 90B-1, принадлежавший 290-й транспортной эскадрилье, попал под огонь британских истребителей над Средиземным морем. Хорошо видно впервые примененное крыло и характерные закрылки фирмы "Junkers". 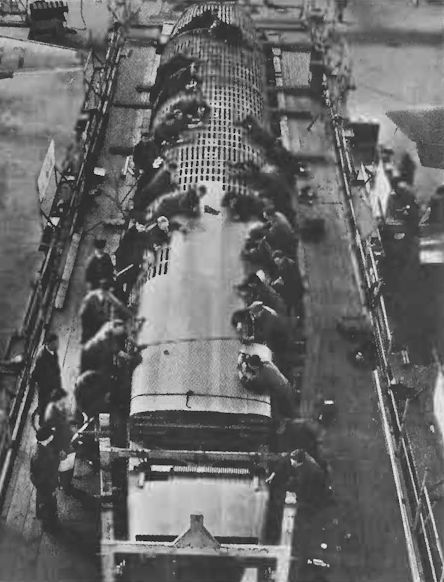 Junkers Ju 90 fuselage under construction. Interior of a Junkers Ju 90. "THESE COMMODIOUS UNFURNISHED PREMISES." The house-agents' jargon seems nicely applicable to the truly startling interior of the prototype Junkers Ju.90 airliner, which is now undergoing its initial flying trials. Divided into five compartments, the cabin will accomodate forty passengers, and there will be several baggage, mail and lavatory divisions. 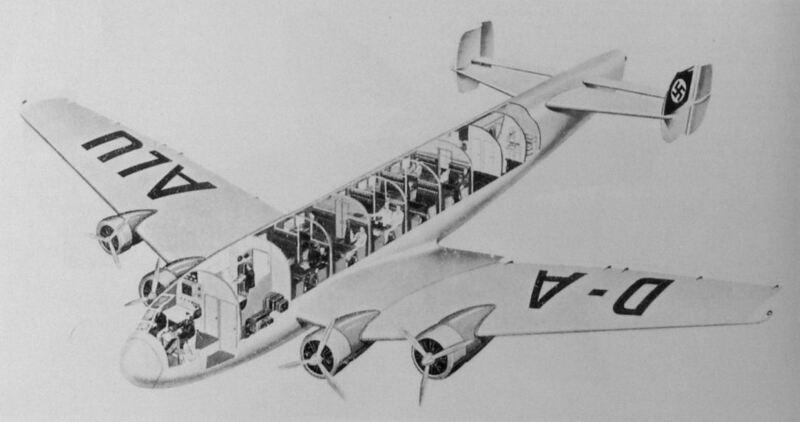 A drawing of the Junkers Ju.90 wich shows the arrangement of the passenger accomodation.